Albert E. Gucker was a 30-year veteran at U.S. Steel’s Irvin Works Tractor Shop. During 8 of those years he had a 30-pound lifting restriction imposed by company physicians. 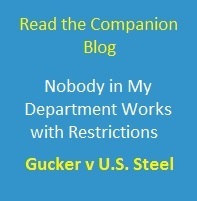 The presence of the restriction meant one of two things: either his job did not require the ability to safely lift 30 pounds or his restriction had been an in-place accommodation. In either case he was receiving protection under Title I of the Americans with Disabilities Act (ADA).